The paper industry consumes enormous quantities of water in manufacturing paper. It is only by the pulp being put into suspension with water that paper can obtain its even structure. Processing primary fibres such as wood or pulp and recovering waste paper both require large amounts of water. At the same time, enormous volumes of wastewater are produced. A decanter is essential for processing the wastewater from paper sludge with regard to reducing costs, protecting the environment and minimising pollution. Generally speaking, less water is required for recovering waste paper than when manufacturing new paper. Nevertheless, considerable volumes of waste water are produced overall. However, the main problem concerns de-inking, i.e. removing the printing ink from the waste paper. The printed waste paper results in special residues in the wastewater, which the decanter removes from the wastewater. As a result, the decanter plays a key role in recovering waste paper. Manufacturing paper is one of the production processes which makes most intensive use of water. In addition, further chemical substances are added depending on the required paper quality. Examples are whitening agents, dyes and pigments. To allow the chemical substances and pigments to be used several times, they have to be removed from the wastewater at the end of the production process. A decanter is also excellently suitable for this. The decanter dewaters the sludge to achieve a high dry matter content. This saves storage and disposal costs. In order to reduce environmental pollution, many pulp mills operate large biological treatment plants. 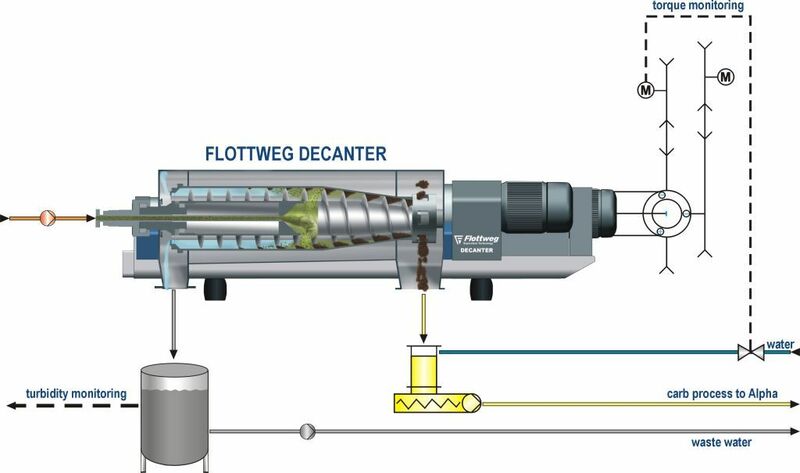 The decanters in the various Flottweg series are ideal for reducing the resulting sludge.